Horfield School are fundraising to purchase artificial turf to lay over two areas of the school playground with the aim of making these areas accessible throughout the year for safe, fun learning and active play. 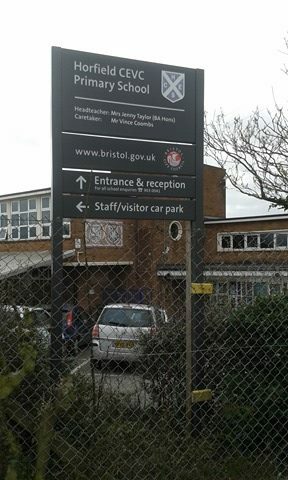 They are trying a few different funding avenues to reach the £30,000 needed but with budgets being tight the money is largely coming from fundraising efforts led by the Horfield School Association. One of their ideas is opening up the space for sponsorship, selling 1m2 sections to individuals for £5 each, or 10m2 for £50 to local businesses. Each square sold can be dedicated to a particular person or group: - some have been named after the buyer's family, some as gifts for the person who has everything and some businesses have purchased them in their company names. They have also had incredible support from ex-students joining in. They provide a sponsorship certificate for each square sold and will be making a feature of named/logoed plaques which will go on display at the school as a permanent reminder of those who helped them achieve their target. Their year 6 pupils approached the school about helping and decided to take up the Fiver challenge: the school gave £5 each to 9 teams and the ideas they came up with to raise money were varied and fantastic. They held a sale at school and raised a fabulous £247 by making smoothies, offering Henna tattoos, creating bespoke badges, selling cakes, sweet treats and chocolate covered marshmallows, it was well supported and the school is very proud of their achievements. They are also lucky enough to be chosen as one of the projects for the Tesco Bags for Help scheme. In nine Bristol Tesco stores (including Tesco Golden Hill) throughout March and April shoppers were able to choose to donate their blue token to Horfield Primary Grass Appeal. The project with the most votes receives £5000! !